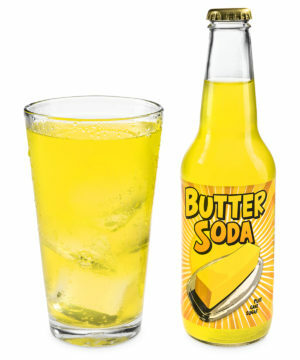 Butter Soda: Sweet dairy-flavored soft drink. Get your Calories in with unctuously unusual Butter Soda. The flavor of churned sweet cream is paired with a sweet, bright hint of citric acid for a balanced, buttery taste. 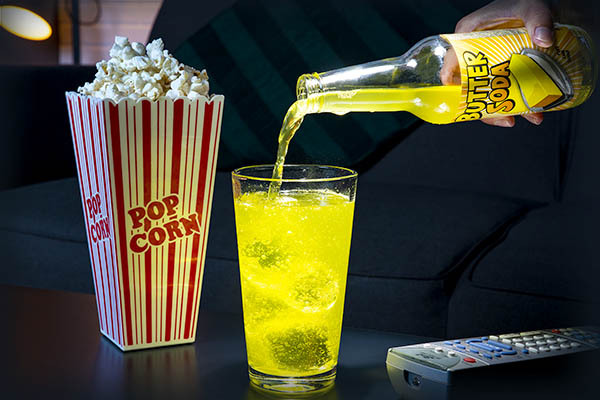 The fizzy, fatty flavor of the strange soda produces entertaining reactions, so make sure to grab yo’ popcorn before watching people try it for the first time! Ingredients: Carbonated artesian spring water, cane sugar, citric acid, natural and artificial flavors, salt, ester gum, yellow 5. Flash pasteurized as a natural preservative. 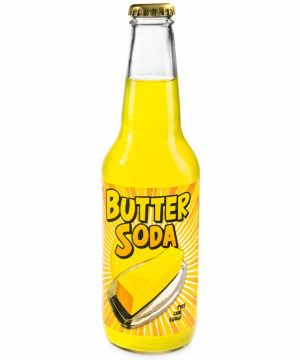 When you first hear about it, Butter Soda seems pretty weird. But when your brain churns on the idea for a bit, weird turns into intriguing. Satisfy your curiosity and your taste buds when you sip Butter Soda, a bubbly concoction with the flavor of sweet creamy butter (but it's fat-free)! It’s soda… that tastes like butter! Answer: Deliciousness is a subjective claim, so it would be unfair of us to make that judgment for you, but we can certainly declare that it's an interesting flavor that's fun to share. Question: Why doesn't it solidify in the refrigerator? Answer: We're not chemists, but the label doesn't explicitly state that the soda actually contains butter. However, we can confidently affirm that it tastes buttery.